What Can a Dermatologist Do for Ingrown Hair? Although an ingrown hair will often go away on its own, it can cause pain, discomfort, and itchiness and can even become infected. Thankfully, there are steps you can take to help prevent ingrown hair and experienced dermatologists in Greeley are available at Front Range Dermatology Associates to treat stubborn ingrown hair. 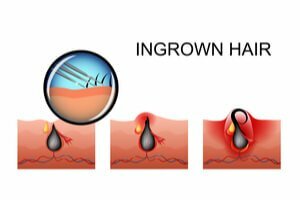 Ingrown hair is a strand of hair that curls inward and grows downward under the skin instead of outward from the hair follicle. This can be caused by a build-up of dead skin cells clogging a hair follicle forcing the hair to grow downward or sideways. Cutting hair too close to the skin can also cause it. The hair becomes trapped under the skin leaving a painful and itchy red bump resembling a pimple. Ingrown hairs typically occur following hair removal methods such as shaving, tweezing, or waxing. They can appear on areas where hair is typically removed including the face, neck, bikini area, legs, and armpits. People with coarse or curly hair are more likely to get an ingrown hair, however, it is a common problem for men and women of all ages and races. What Does an Ingrown Hair Look and Feel Like? An ingrown hair appears as a small red bump or group of bumps. These red bumps may look like a pimple or a small sore. They are usually itchy and uncomfortable, but can also be painful. Other signs of ingrown hair include embedded hairs and darkened skin. How Do You Know If an Ingrown Hair Has Become Infected? How Can You Treat an Ingrown Hair? If you have an ingrown hair make sure to avoid picking, popping or plucking the area and, if possible, stop shaving until it heals. Moisturizing the area and wearing looser clothing could help to ease the discomfort, but the most effective way to treat ingrown hair is to schedule an appointment with your dermatologist. A Topical Steroid Cream: These creams are available both over-the-counter or at a higher prescription strength concentration and work to reduce inflammation, irritation, and itchiness. A Retinoid Cream: These prescription creams are applied to skin and used to exfoliate and remove dead skin cells. They also help treat dark, thickened skin resulting from an ingrown hair. An Oral or Topical Antibiotic: If it has become infected, your doctor may prescribe antibiotic pills or a cream to treat the infection from the inside and reduce inflammation. Removal of the Ingrown Hair: Ingrown hairs typically improve in time without removal, however in extreme cases, your dermatologist may choose to remove the hair. Never attempt to remove an ingrown hair on your own; this will only increase your risk for infection and other complications. Turning to Laser Hair Removal: If ingrown hairs seem to be a common occurrence for you, your dermatologist may recommend that you consider permanent forms of hair removal. To schedule an appointment to treat an ingrown hair, contact us at Front Range Dermatology Associates today.